AMSTERDAM — Three U.S. companies will set up offices in Luxembourg, the latest sign of an ongoing effort by the small European country to diversify its space economy. The government of Luxembourg announced Sept. 27 that CubeRover, Hydrosat and Made In Space will all establish facilities in the country, in many cases working with local universities and companies. The work those companies do in Luxembourg will range from development of robotic arms to small planetary rovers. 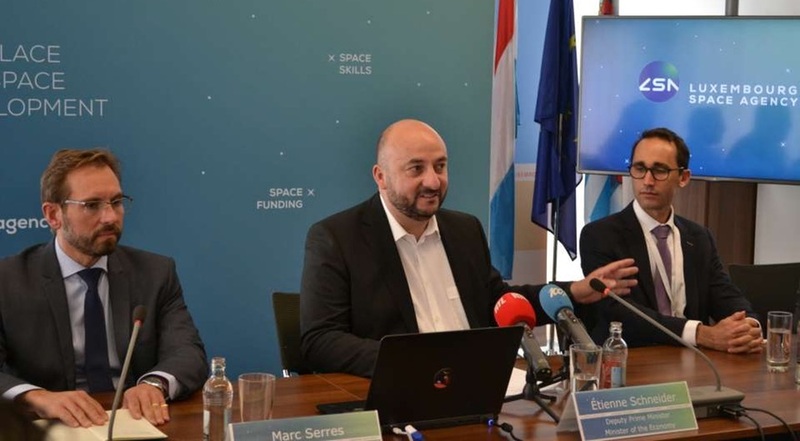 “The success of our development strategy for the space sector, including the recent launch of the Luxembourg Space Agency, is confirmed once more with the settlement in Luxembourg of three space companies that plan to employ up to 85 people in the Grand-Duchy by 2023,” said Étienne Schneider, deputy prime minister and minister of the economy of the Luxembourg government and the driving force for the country’s recent space initiatives. The largest agreement, in terms of jobs created, goes to Made In Space. That company, best known for additive manufacturing work on the International Space Station, plans to work on a low-cost modular robotic arm for in-space applications, and will create up to 50 jobs in the country. “While we believe this product will reduce satellite makers’ barriers to greater capability on orbit, we also see our robotic arms as being integral to constructing space gateways, building lunar habitats and assisting in the in-space construction of future space stations,” said Jason Dunn, the founder of Made In Space, in a statement. The company said that doing that work in Luxembourg allows it to “effectively partner” with European aerospace companies, although the company did not identify any specific partners. The robotic arm it develops in Luxembourg will initially be sold only in the European market before later offering it more broadly. CubeRover, a spinoff of commercial lunar lander company Astrobotic, will set up operations in Luxembourg to develop rovers weighing as little as two kilograms for lunar exploration. Astrobotic has been working on the project internally, with some support from NASA’s Small Business Innovation Research program. Neither the Luxembourg government nor the companies disclosed what sort of financial or other incentives they received to set up operating in the country. CubeRover, in its statement, referred to “resources and relationships” provided by the Luxembourg government but was not more specific. Luxembourg has provided financing to companies in the past to lure them to establish a presence in the country. Through its SpaceResources.lu initiative, the government initially focused on companies involved with asteroid mining and related activities, but has in the last year expanded that to include a broader range of space startups. The government also established Sept. 12 a national space agency, the Luxembourg Space Agency. One role for the agency will be to further build up the country’s space industry, including through a new Luxembourg Space Fund that will have 100 million euros ($116 million) available to invest in space companies.